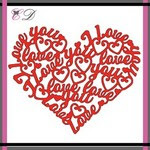 Today Gloria here to share a card using Love collage die. I made a clean and simple card using kraft paper. To create this card, first I cut 4.00" x 5.24" rectangle white card stock and die cut with Love collage die as shown. I cut a 4.25" x 5.5" rectangle kraft paper for background too. I used inlaid technique for this card. I adhere the heart pieces in to the white card stock and then adhere on the kraft paper. I think the die is perfect for Valentines' day.